Theoretical physicist Elad Eizner from Ben Gurion University, Israel, and colleagues created models to study the attractive forces affecting atoms located at a wide range of distances from a surface, in the hundreds of nanometers range. 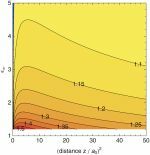 Their results, just published in EPJ D, show that these forces depend on electron diffusion, regardless of whether the surface is conducting or not. Ultimately, these findings could contribute to designing minimally invasive surface probes. 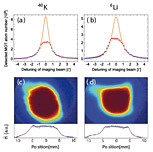 Atomic and molecular collisions occurring at low impact energies and for neutral targets need adequate methods for accurately measuring their scattering properties. Such measures are fundamental to the description of the dynamics of plasmas and provide insight into the long-range Coulomb interactions between charged particles. In the last twenty years many novel non-perturbative approaches have been applied. The time-dependent close-coupling (TDCC) approach, discussed in this EPJD Review, differs fundamentally from previous non-perturbative approaches in that it solves the time-dependent, rather than time-independent, Schr¨odinger equation. This Review provides a detailed description of the application of the time-dependent close-coupling approach to ionising collisions of electrons, photons and ions with small atoms and molecules. An international team of scientists working at the Plasma Technology research unit at Ghent University, Belgium, has determined for the first time the absolute density of active substances called radicals found in a state of matter known as plasma, in a study just published in EPJ D. These findings could have important implications for medicine—for example, for stimulating tissue regeneration, or to induce a targeted antiseptic effect in vivo without affecting neighbouring tissues. Study looks at ways to improve the quality of matter akin to that found in plasma screens by dissolving its self-organised hexagonal filament structures made of electric discharge. A new study improves our understanding of plasma sources, a state of matter similar to gas in which a certain portion of the particles are ionised and which are used for example in plasma display panels. These results revealed by physicists from the University of Greifswald, Germany, Robert Wild and Lars Stollenwerk, and are about to be published in EPJD. A trade-off between photon source settings and detector specific requirements allows the generation of high-fidelity single photons. Study describes greater chances of accessing more reliable information on applications in quantum computing and cryptography. Theoretical physicist Filippo Miatto and colleagues from the University of Strathclyde, Glasgow, UK, have found a new method of reliably assessing the information contained in photon pairs used for applications in cryptography and quantum computing. The findings, published in EPJD, are so robust that they enable access to the information even when the measurements on photon pairs are imperfect. A Chinese team has performed simulations to help understand the occurrence of multiple solitary optical waves that are used to reconfigure optical beams. Researchers have designed the first theoretical model that describes the occurrence of multiple solitary optical waves, referred to as dark photovoltaic spatial solitons.